Corporate Social Responsibility: The Curious Case of UCB | Mutuk5. A bit of a boring topic some may say, no doubt, but one that is all the more relevant in today’s world: Corporate Social Responsibility. My essay explores one successful example of good CSR in the form of United Colours of Benetton’s approach to tackling anti discrimination through their advertising. At a time of racially inappropriate and racially exclusive marketing, UCB have taken the liberty of tackling the controversies of ethnic inequalities by the horns, knowing that doing so not only adds value to their brand, it also addresses an issue that society, more often than not prefers to vehemently and deliberately exclude from debating let alone confronting. The case for businesses taking a philanthropic interest in the fate of the world and the issues that undermine society’s progress manifests itself in the creation of shared value and not merely profit per say, as Kramer and Porter point out (Kramer & Porter 2011). Shared value connects societal and economic progress by broadening the scope and aim of capitalism from being an economic framework of operation that has leaned towards cultivating the interests of business at the expense of society, and or subgroups within it. Hence, many businesses have rightly realised over the years that there is an indisputable link between good corporate social responsibility and the long term value of their organizations. The case for practicing good CSR exists, and there is a general acknowledgment of this across the board, ratified no less by the UN Guiding Principles which were formulated as recently as 2011. A nascent set of governing statutes, the UNGP’s preside over a nascent way of thinking; namely adding shared value through the ethos that business need to become more involved in mitigating social issues even if such issues are not directly linked to the operations and thereby may even entail that companies incur a short term profitability loss in actively practicing responsible CSR. With this said, this essay examines the approach of Italian clothing manufacturer United Colours of Benetton towards diversity and anti-discrimination from the perspective of the human rights framework. Essential in this examination is the correlation between the stated policies towards these issues on the part of this brand and the actuality of these policies in the day-to-day practice and operations of UCB. Though I focus more on their approach to diversity, their stance on anti-discrimination is also briefly discussed. In order to gain an understanding of UCB’s approach to diversity and anti-discrimination, it is important for us to know what is meant by this term and its application in the context of the operations of a business. In similar vein, the legal framework in place regarding this topic is also of interest, as a guideline, albeit a vague one, concerning how best businesses ought to approach the issue. Pincus contends that discrimination comes in many forms, manifesting itself on an individual, institutional and structural basis for the purposes of preserving the power of specific hegemonies at the expense of minority groups within such power structures. (Pincus 1986). “Although all three types of discrimination are serious problems, it is harder to deal with structural discrimination than with the other two (individual and institutional” (Pincus 1986) and, crucially for the discussion in this essay “confronting structural discrimination requires the reexamination of basic cultural values and fundamental principles of social organization” (Pincus, 1986). Reiterating my opening statements concerning the convergence of cultures and stakeholder groups in society through processes of globalization, it is evident that a greater tolerance of differences in social and ethnic groups is necessary for the coexistence and development of all societies. The implication of this entails that society as a whole needs to work to address the issue of discrimination in the interest of developing just, morally-correct societies. Within this, businesses too have a responsibility; “to avoid causing or contributing to adverse human rights impacts through their own activities and address such impacts when they occur” and, more importantly, to “seek to prevent or mitigate adverse human rights impacts that are directly linked to their operations, products or services by their business relationships, even if they have not contributed to those impacts” (UN Guiding principles on Businesses and Human Rights 2001). This responsibility is emboldened by the fact that structural discrimination is a particularly difficult strand within the discrimination discourse, as discussed earlier on. We will return to the UNGP’s further on, for now, let us look at the policy of United Colour of Benetton and their link to tackling diversity issues in modern society. United Colours of Benetton are a subsidiary of parent company, The Benetton Group, a global fashion house based in Italy, with over 6500 stores in 120 countries, making it a multinational business in every respect. Such a multinational character poses challenges on the level of policy implementation for any business, as different markets and cultures pose different needs that require addressing in specific ways. The Benetton group has responded to the challenge of being an international brand by creating specific initiatives designed to address issues of diversity and discrimination. Keeping in mind the UN guiding principles and the responsibility businesses have to avoid causing or contributing to adverse human rights impacts through their own activities, UCB appear to be a business that go beyond this minimum requirement and attempt to contribute to society in a meaningful manner that supersedes the “do no harm maxim” that accompanies the minimum expectations that the UNGP’s have of companies. On an general level, “Social commitment, concern for the environment and ethical behaviour are core values of Benetton Group, a company always conscious of the importance and significance of a responsibility that goes beyond its commercial objectives.” (UCB corporate website 2013). This bold statement is accompanied by policy making that manifests itself in concrete organizational and departmental strategy that specifically focuses on the issue of discrimination and diversity. One such initiative is UCB’s “UNHATE” foundation, a corporate campaign whose root objective is that of promoting cultural diversity through encouraging greater tolerance and more respect for racial and ethnic differences. Youth are the target group of the foundation, which cites “hate as one of the causes of the lack of social and economic development of new generations” (UCB UNHATE campaign website 2013). In this respect, “ UNHATE Projects support concrete actions in local communities to promote dialogue and the acceptance of diversity, and with their strong message promoting human rights, aim to engage the attention of the public and promote positive actions, where anyone can become a player in the fight against intolerance, from the global scenario to everyday life” (UCB UNHATE campaign website 2013). This is all well and good, from a communication perspective; UCB appear to have very clear goals regarding their approach to diversity and anti-discrimination through their promotion of tolerance and positive values across different cultures that takes its point of departure in the youth but that also engages numerous other stakeholder groups in the process. Is this, however, merely a cosmetic exercise or is the UNHATE campaign a concrete example of pro-UN guiding principles action ? Part of the UNHATE campaign has included visual, video and community-based marketing that has involved the creation of material whose objective is that of provoking some of the essential norms propagated by today’s societies. 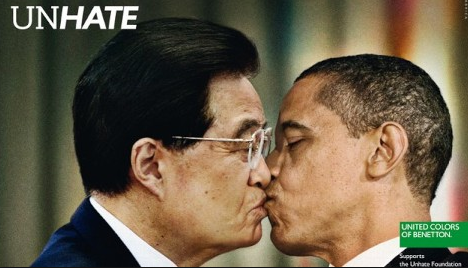 Such images have included pictures of Chinese President Hu Jintao kissing US President Barack Obama (see appendix 1 ) and another similar, lip-locking image that featured Pope Benedict XVI and Ahmed Mohammed El Taleb engaging in the same activity. The latter image provoked controversy to the extent that the Vatican announced it would take legal action against UCB after it took offense to it. Benetton’s diplomatic response was to remove the image from all publications whilst “reiterating that the meaning of the campaign is that of combatting the culture of hatred in all its forms” along with an apology for the offense caused to the sentiments of the faithful (Benneton Press group note, 2012). Such controversy not only demarcates the issue of diversity in today’s world, it also denotes the intention of a company like Benetton to voice its opinion on the matter, not merely in an attempt to garner more sales revenue, per say, but rather, to take responsibility and “seek to prevent or mitigate adverse human rights impacts that are directly linked to their operations, products or services by their business relationships, even if they have not contributed to those impacts” (UN Guiding principles on Businesses and Human Rights 2001). aegis of the UNHATE Foundation, seeks to challenge clichés about youth non-employment and asserts a belief in the creativity of the world’s youth. non-hate, will support youth to become actors of change against indifference and stigma.” (UCB UNHATE foundation webpage, 2013). Testimonials and ideas are shared on social media and a few of the best ideas selected for corporate sponsorship by Benetton. This promotes a culture of co-creation and negotiation between stakeholders and the company, allowing for people who are not necessarily involved with the Benetton brand to take part in discussing some of the social issues that they feel strongly about, such as the right to employment irrespective of ethnicity. Crucially, consolidating the fact these efforts, UCB’s own recruitment policy is one that echoes the company practicing what it preaches, operating by maxims of granting employment opportunities to all, irrespective of race, gender and ethnicity. “ Benetton Group recognises diversity as a source of enrichment, and offers opportunities without discrimination. Diversity and equal opportunities represent fundamental values in the company and are clearly mentioned in the Group’s Code of Ethics.” (UCB recruitment policy, UCB webpage 2013). This last point illustrates the commitment to implementing the values that the company brands itself by and proves that they are indeed good CSR practitioners. The visual campaigns and the unemployee initiative under the umbrella of UCB’s UNHATE campaign demonstrate a hands-on CSR approach by the company that doesn’t shy away from directly confronting issues of discrimination and diversity that are widely downplayed or ignored in today’s societies. “Failing to raise questions about power relations between identity groups in organisations feeds the contemporary tendency to deny the existence of structural barriers to opportunity in favour of the myth of a meritocratic society that rewards individual achievement” (Sidanius & Pratto, 1999 p 106 in Konrad 2003). By provocatively questioning such power relations and creating opportunities for discussion and debate around them, UCB are not merely complying with the triple bottom line stipulations of the UNGP’s but rather, they are going beyond the scope of their business operations and adding their voice to a contested if not relevant debate of our time. Were one to approach UCB’s policies in a more critical light over time one could argue that their marketing campaigns and in general the approach to diversity is at times, excessively maverick and over-the top. The fact that their 1991 deathbed image of AIDS activist David Kirby dying is ranked as the most controversial campaign of all time in the Guinness Book of Records is a testament to the sort of debate that UCB’s diversity-related practices have triggered over time. This campaign was part of a series of controversial images that had little to do with the overall brand of USB due to, amongst other causes, the fact that the company contracted Italian photographer Oliviero Toscani to manage the campaign and gave him complete freedom to develop imagery of his choice. Given the volatile nature of CSR and the fact that it is in many instances a double-edged sword that can easily do as much harm as good, UCB should indeed be wary of inciting and inflicting more damage than positive credit to their brand name. With this said, this consideration seems to have been incorporated in the modern UCB approach to diversity, which seems to be more mature, and flexible towards the demands of their customer base, as I have discussed in this essay. To conclude, this essay has examined the approach of clothes manufacturer United Colours of Benneton to diversity and anti-discrimination. It is clear that, on the basis of the UN guiding principles, UCB not only conforms to the human rights framework; but rather, goes beyond the minimal maxim of doing no harm by taking a civilized altruistic approach to confronting controversial dominant views on diversity in society. Whilst their campaigns have been maverick and rogue in the past, their modern approaches are more mature, consistent and user-driven. These approaches and viewpoints are backed by in-house policies that extend the same ethos to matters of recruitment and human resources, giving the Italian fashion brand a quality of being practitioners of what they preach.